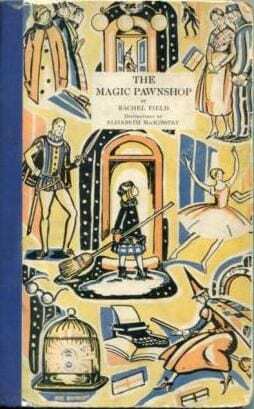 Here’s a rare find: an absolutely wonderful book that has fallen into obscurity for no good reason. 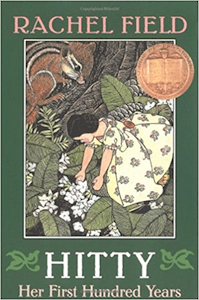 Nine-year-old Prinda goes out on the snowy streets of 1920’s New York, on New Years Eve night, to find a miracle for her sick uncle. She discovers a pawnshop, featuring signs saying “A Small Supply of Magic On Hand For Regular Customers” and “Broomsticks Our Specialty,” run by a witch who needs to go gather magic for the new year. She agrees to bring back a miracle if Prinda will watch her shop for the night. During Prinda’s evening as shop-minder, a young woman pawns her conscience for a ball gown, a young playwright pawns his finished play, a heartless family tries to reclaim the aunt they pawned months ago, and Prinda helps two couples, one young and one old, find happiness, while using up the last of the shop’s remaining bottles of magic — the red one (“Especially effective in cases of heart trouble or seriously impaired affections”), the yellow one (“A sure cure for indifference”) and the vivid green one (“In case of startling events”). 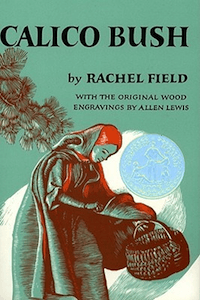 Rachel Field is famous for two other books, Hitty: Her First Hundred Years (1929), which won the Newbery Medal, and Calico Bush (1931), which won a Newbery Honor. These two books couldn’t be more different from Pawnshop, both in style and subject. It’s a shame that while they are widely available (though neither has aged particularly well), Pawnshop, still bright and lively, is out-of-print and rare. That reminds me of a book that involved potions at the local pharmacy; the red one (or was it green?} enabled a person to understand the speech of animals, while the blue one (or was it the red?) canceled the magic of the first… as a subplot the pharmacist licked his fingers while the filling the children’s prescription and was driven crazy by listening to the animal comments all around him. Sadly, I cannot remember why the children were able to get the prescription for potion, or what they did with it.